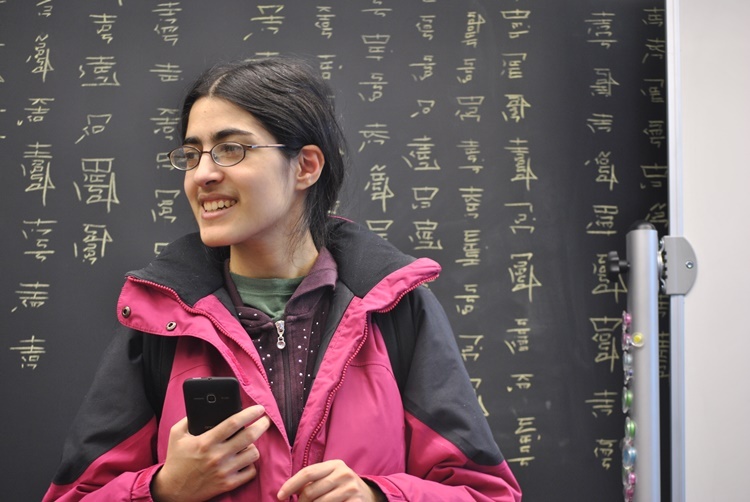 As part of the capstone program in Carnegie Mellon University, we partnered with MARi to create an engaging mobile experience that would help keep students in track with as well as motivate them on pursuing their career goals. We conducted research in several research areas with various user-centered methods to identify the current ways students are navigating their way towards their future careers, and how we can help facilitate and improve the process. Through our research, we identified two aspects in a student's career-searching journey where there is opportunity for improvement: awareness and motivation. To help high school students with the awareness aspect, we designed the Job View feature, which allows students to view the daily life of someone in a certain profession through fun, social-media-like posts. 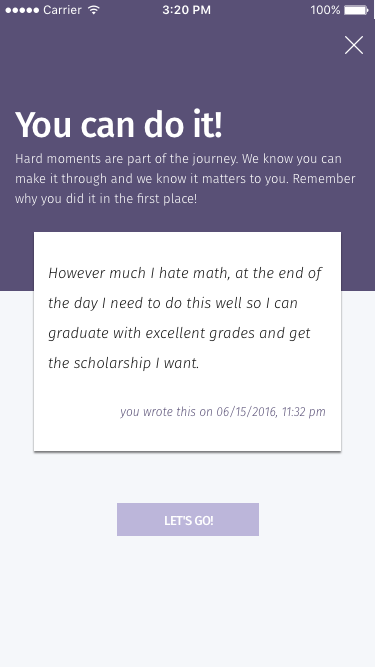 To help with the motivation aspect, we created peptalk, which allows students to post reflections for their goals, as well as view pep talks from various sources. We also designed gamification screens, where students can collect badges and earn points on the app. All these features are combined with the existing MARi application to augment the student's career searching experience. In the spring of 2016, we started our research process, conducting several different methods of data collection. We tried to involve users as much as possible in our research process, but we also referred to available literatures and carried out competitive analysis. The data that we gathered in this process was then synthesized through a process called affinity diagramming, which then led us to the 9 main aspects that students need in their career-searching journey. We found that the 9 findings fell into 3 distinct themes, which we then transformed into a model called The Mountaineering Model. The model stems from a metaphor where a student is at the bottom of a mountain with their academic and career goals at the summit. 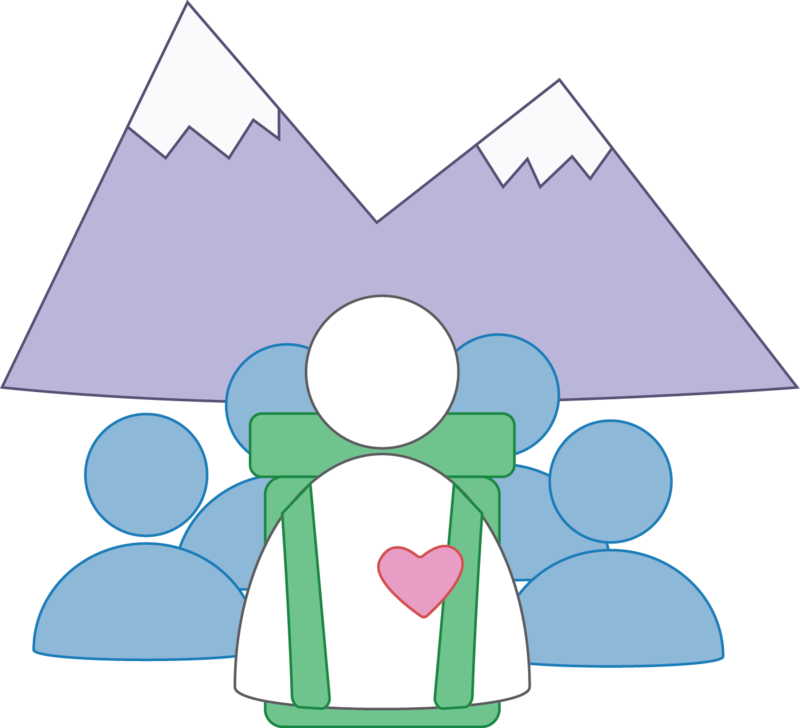 MARi Mobile aims to provide guidance on the path up that mountain, and it can do so by influencing three factors: grit, gear, and group. Grit comes from within the student. Findings related to grit concern a student’s own mental state and perspective. Gear is the external tools that best equip a student for success. These findings relate to the support and scaffolding that a product should provide to the student. Finally, Group refers to the substantial impact of other people on the student. It matters who you’re with, both for motivation and support. To view a more detailed information about our research and findings, take a look at our research section. After a visioning session that we conducted during our spring final presentation, we moved on to summer of 2016 to begin our development process. Through discussion with MARi, we identified two prominent findings, which are awareness and motivation. These two aspects are the primary focus of our product, but we tried to create a product which can encompass other findings as well, such as reflection, personalization, and scaffolding. Instead of creating a standalone product, we developed features to integrate with MARi's existing application. Our two main products are Peptalk and Job View. Peptalk prompts students to write reflections at multiple points in their process of setting and working on goals and delivers peptalks written by others to encourage them in their work. 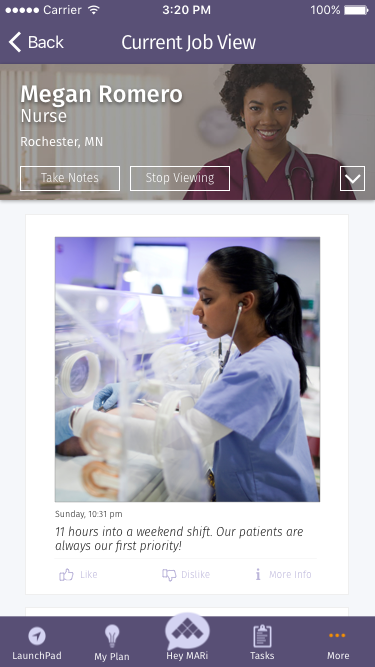 Job View provide a non-traditional, social media-like way to see the wide variety of activities that students may encounter in a certain profession. Our process followed agile methodology to encourage frequent iteration and user feedback. The summer was divided into 4 phases of 2 weeks each, with each week considered as a sprint. We corresponded with MARi weekly after every sprint to ensure we were on the same path and to verify our next steps, based on both user testing and client requests. During the first sprint, there was much time spent in synthesizing information from the visioning session from our spring presentation and modeling the resulting themes through user flows as some features having several options to choose from. Through discussions with MARi, the user flows were narrowed down. The remaining 3 sprints took the designs from low to mid to high fidelity and were presented as a continuous iterative design process. Finally, we present our recommendations for how to move forward with our features. For a more detailed information about our product design and iteration process, take a look at our development section. MARi LLC is a human performance operating system that creates matches between students and potential employers using a match, gap, recommend process. One of the main goals that MARi has is to help students become better prepared for their careers of choice. Students will be able to keep their data even after they have graduated. The data from one student is actively used to inform the recommendations given to other students, giving MARi users a sense of community where students are able to support their peers. By interacting with MARi and providing each data stream, students are actively contributing data to the MARi platform, helping everyone reach their goals faster. MARi is targeted towards various parties who are involved in the process of students’ academic and career tracking; from the students themselves, teachers, counselors, parents, as well as employers. However, this capstone project is focused on students in 9-12 grades as they begin their academic and career planning for post-secondary school and/or work. 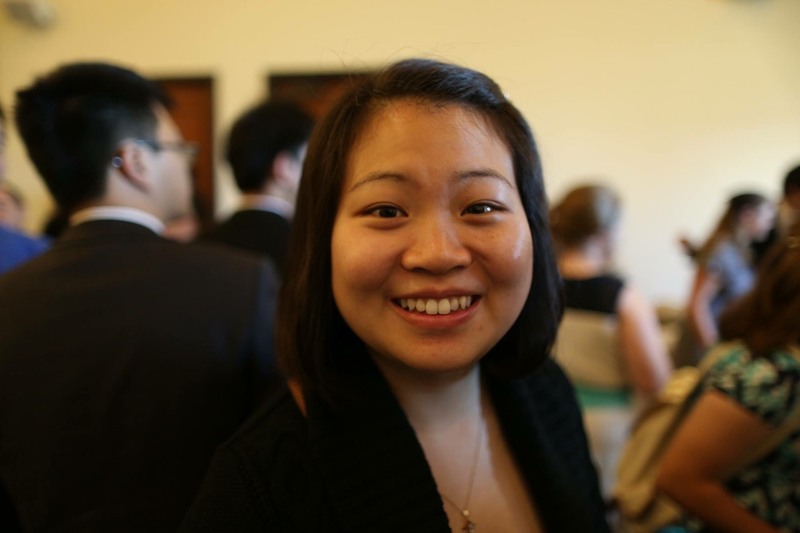 Kathleen Yu graduated from Carnegie Mellon in 2014 with a degree in Electrical and Computer Engineering and minor in Human-Computer Interaction. Before coming to METALS, she studied abroad in Istanbul, Turkey for a year. Currently, she is interested in Language Acquisition Technology for a career in that after graduation in August. Alexandra Brusilovsky (Sasha) graduated from the University of Pittsburgh in 2014 with degrees in Computer Science and Linguistics and a certificate in Russian and Eastern European Studies. 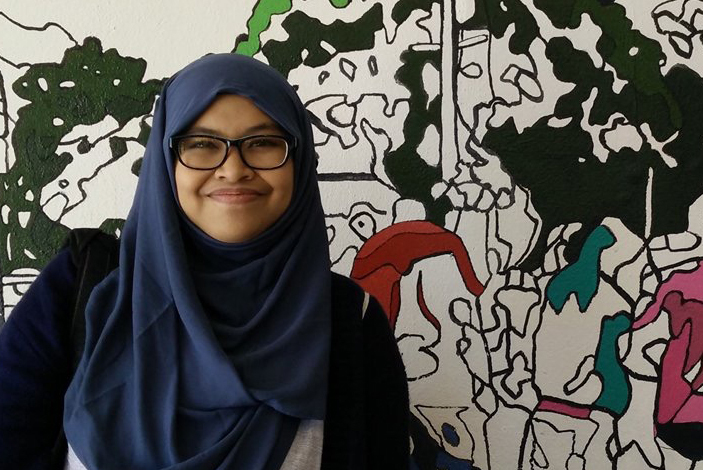 Halida A. Herwan pursued her undergraduate study in her home country in Indonesia. She graduated in 2011 from Bandung Institute of Technology, majoring in Informatics Engineering. Her interest in METALS came from her interest in using Human Computer Interaction for education in Indonesia. 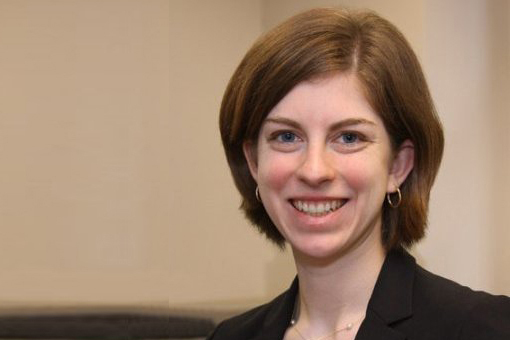 Cassie Taylor is the Director of the Behavioral Economics and Evidence-Based Policy Lab at Carnegie Mellon. She graduated from the METALS program in 2015 and received an undergraduate degree in psychology from Princeton University (2012). Prior to METALS, she worked in analytical consulting.